From the time my kids could hold a crayon, I helped them make the gifts they’d give their loved ones on Christmas morning. My hope was that amidst all the material trappings of the holiday, an ornament made from a shell they collected on the beach or a colorful, hand-painted picture frame might provide them with a true sense of giving. It’s likely you’ve never considered candy wrappers as a gift. Well, I hadn’t either—until last year. To fully explain this, I must travel back to a summer spent in Tent 17 at Alford Lake Camp in Hope, Maine. Along with the essential camp skills of pitching tents and building fires, I became well versed in less essential but really fun skills, such as playing jacks and short-sheeting beds. That summer, one new friend, Elliott, was responsible for teaching me some curious trivia, some of which I still randomly remember. Do you know, for example, that a “sniglet” is a made-up word for something that doesn’t have an official word to describe it? And if you eat a Tootsie Pop and its wrapper includes a Native American shooting an arrow at a star, it is very, very good luck. As a lifelong fan of chocolate Tootsie Pops, I mentioned this to my kids on more than one occasion. So when I unwrapped a present given to me by my younger son last year and found a stack of Tootsie Pop wrappers, I understood what most would not. Though there was no candy, all of the wrappers bore the lucky image. 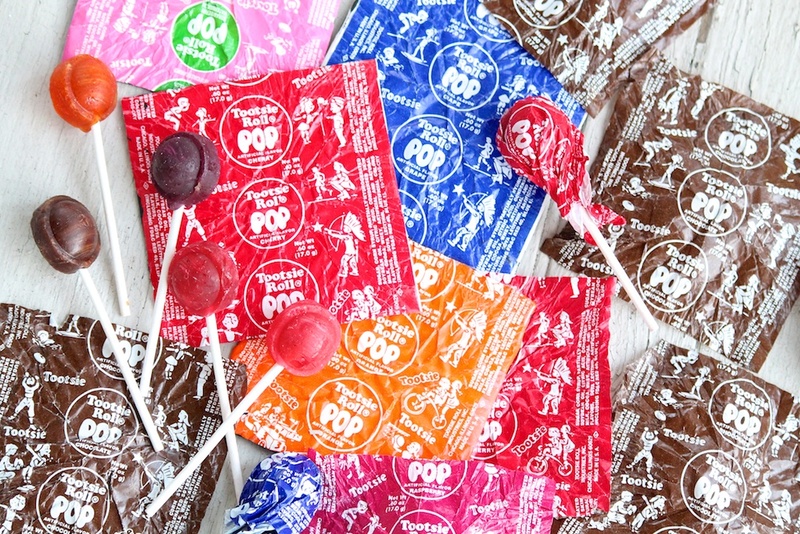 He explained that it took several bags of lollipops to find so many wrappers, and he hid the unwrapped candy in a bag under his bed–he figured it wouldn’t seem like much of a gift if he benefited from all of the sugar. Some of the wrappers were fashioned into coasters to make them truly practical. I mean, can you think of a better gift? I have tucked away this special package and smile every time I think of it. To me, it’s a reminder of a phrase that seems overused. It really is the thought that counts. So if you’re struggling to come up with the ultimate gift for someone special or even the perfect recipe for a big occasion, just think of the wrappers. The best of what we give can’t be held, eaten or even bought. The value of what we give is truly in the intention. 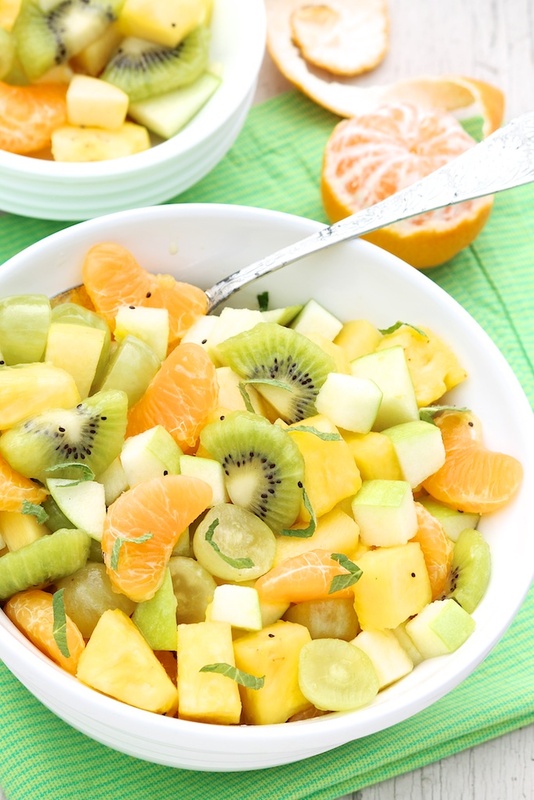 In the spirit of simplicity, I offer this easy fruit salad. A welcome accompaniment to your favorite coffee cake or sausage and egg casserole, we think this colorful fruit salad is equally delicious with a side of vanilla yogurt and a sprinkle of granola. A smidgen of honey and lime juice add a tangy-sweet note, while the mint provides a fresh finishing touch. I especially like the interplay of the mint and pineapple. For ease of eating, make sure to cut the pieces of fruit no bigger than bite-size. Also, ripe kiwis are fairly soft. To keep them from squishing when the salad is tossed and served, use kiwis that give just a bit when pressed gently and slice on the thicker side. For visual appeal, I usually choose one yellow and one green apple for this salad, but feel free to use your favorite crisp variety. 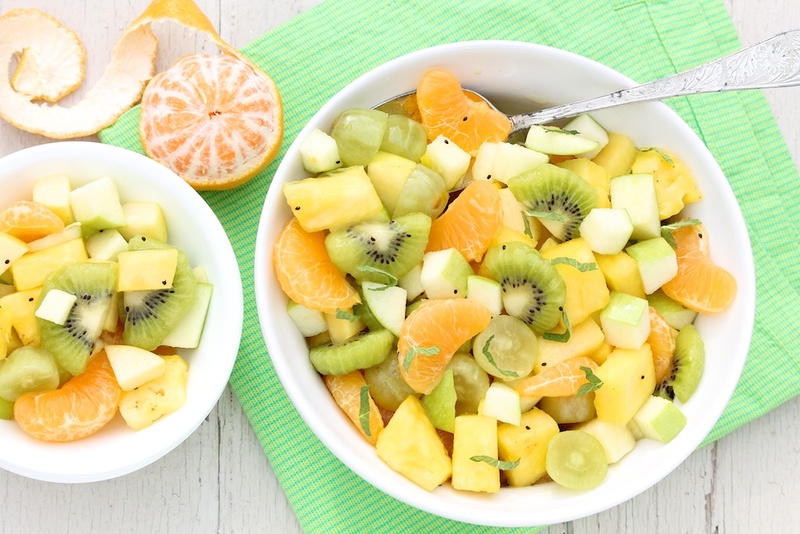 Combine the pineapple, clementines, kiwis, apples and grapes in a large bowl. In a separate small bowl, stir together the honey and lime juice. Pour the juice mixture over the fruit, sprinkle the mint overtop, and gently toss to combine. The tootsie roll story is the best. Only a child’s wonderful mind! Thank you, Jean. It’s a gift I will always cherish! This salad is refreshing and delicious! Took it to a New Years Day covered dish and it was a big hit. Definitely will repeat. That’s great, Carolyn! So glad it’s a keeper!